ROAD TOWN, Tortola, VI- September 6, 2017 is no doubt a date that will go down in Virgin Islands (VI) history. It was the day when the powerful Category 5 hurricane, Irma, wreaked havoc on the VI, leaving death, destruction, widespread looting and panic in the streets for food and gasoline. The powerful furious winds toppled cars and planes, sank boats, took off 90% of roofs from homes, businesses, and churches, flattened shacks and animal farmhouses, uprooted trees and broke utility posts. 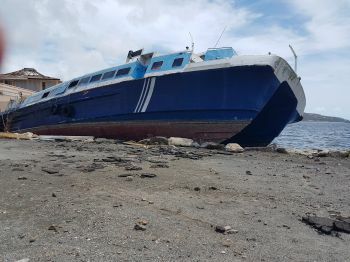 In some cases, the storm which packed winds in excess 200 miles per hour lifted 40 foot containers filled with goods and moved them far distances. Even mega boats, heavy equipment and some heavy industrial generators were no match for Irma. One of the items Hurricane Irma moved was an ex passenger boat, named Mayflower, belonging to Smith's Ferry Service. Irma moved anything in its way! While it’s our understanding that the boat has been out of commission for some time, it took the boat from Cleaning Hole down in the Fort Burt area of Road Town and landed it on a parking lot on Waterfront Drive in the area of the ferry docks. 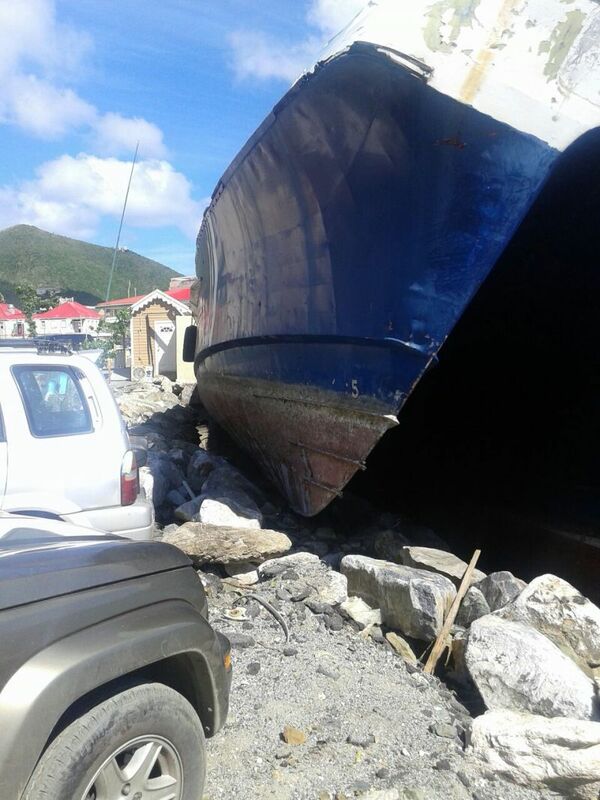 It is also touching the back of the dock belonging to the BVI Ports Authority. As of today, November 27, 2017 the boat is still there and persons close to Smith’s Ferry Service told our newsroom they are waiting on a barge to remove the vessel. The Acting Managing Director of the BVI Ports Authority (BVIPA), Mr Alfred 'Al' Henley, when contacted, said the Ports Authority is anxious to have the boat removed and they have written to Smith's Ferry Service on two occassions, giving them a deadline of the end of November 2017 to have the vessel removed from its present location. 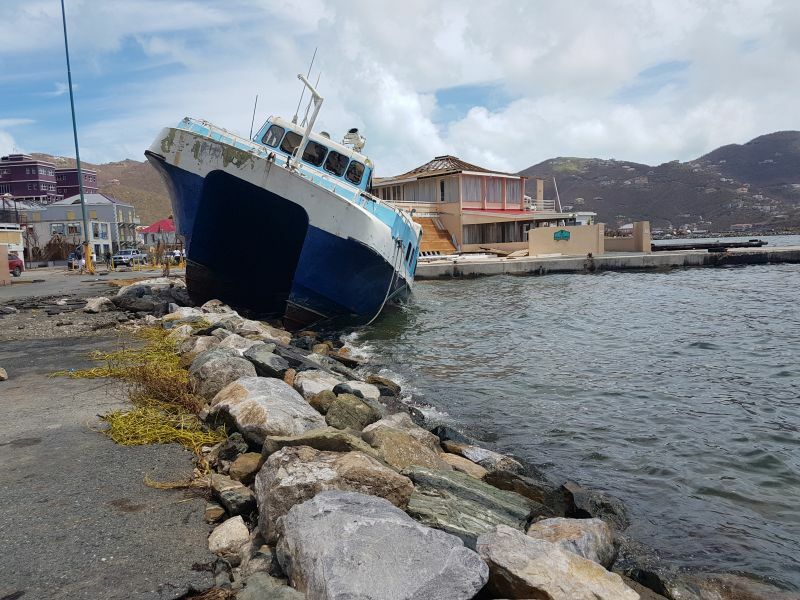 One thing is clear- the boat has become a powerful symbol of the devastation and power of the killer storm Irma. Just like all the spoiled aid on the festival ground ( I blame the Governor. How many bloggers been saying something is wrong and ask for an investigation). Now, How difficult is it to get this thing move. It need moving. Too much Politics turning little things into big things. Lite work into heavy work.. . Same way they made giving out aid such a mountainous and Samson task.. Simple Shxxixxt.. Since, it's not that difficult, you move it. @ too much politics - Your post reminds me of an old saying. "Best to engage brain, before putting mouth in gear'. Frazer start getting your disciples ready to take over this place.. Time we start moving like we serious. Why al does not pay to move thr boat from writing letters? It will be moved when Government(aka Tax Payers) pay to have it move.